Would Your Kitchen Pass a Food Safety Inspection? Restaurants must pass regular food safety inspections to stay open. Would YOUR kitchen pass a food safety inspection? In the United States, the “Food Code"—developed by the U.S. Food and Drug Administration (FDA)—serves as a model to help health jurisdictions nationwide develop food service food safety standards. For consumers, the U.S. Department of Agriculture (USDA), Centers for Disease Control Prevention (CDC) and FDA work together to provide food safety guidelines for use in the home. NOTE: Consumer guidelines sometimes differ slightly from restaurant guidelines due to such factors as differences in home and professional equipment. DIRECTIONS: With these guidelines in mind, let’s see if your kitchen would measure up! 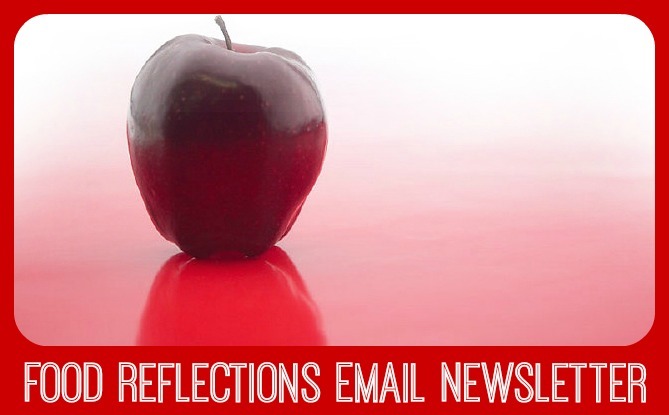 Choose the answers that most closely apply to YOUR everyday practices in your kitchen. Then compare your answers with the desired practices according to government guidelines for consumers. 2. What is the temperature of your home refrigerator? 3. How do you thaw meat, poultry and seafood products? 4. How many days do you usually store perishable leftovers in the refrigerator? 5. 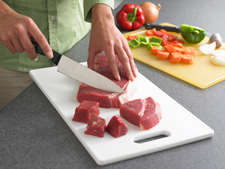 When using a cutting board: If you’re cutting raw meat or poultry, what do you do before cutting fresh produce or bread before the same meal? 6. 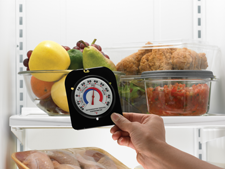 How do you determine whether you have cooked meat, poultry and seafood to a safe temperature? 7. Which of these describes your handwashing when working with food? 8. When cooking raw poultry and meat, what do you do? 9. Before eating melons, what is the first thing you do? 1. a. Two or less hours: Illness-causing bacteria can grow in perishable foods within two hours unless refrigerated—and within one hour if the temperature is 90ºF or higher. Divide leftovers into clean, shallow containers so they chill faster and refrigerate within two hours. Refrigerate within one hour when the temperature is 90ºF or above. www.foodsafety.gov/keep/foodkeeperapp. Access the app through your web browser; it is also available as a mobile application for Android and Apple devices. While the quality of food decreases the longer food is in a freezer, it will be safe indefinitely when stored at 0ºF. 3. b. In the refrigerator or c. In the microwave: Thawing meat, poultry and seafood in the refrigerator is the safest way as foods remain at a safe, constant temperature of 40ºF or lower. Place the food on a plate or pan that can catch any juices that may leak. 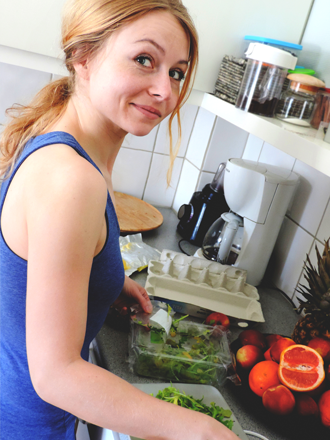 Normally, smaller amounts of most foods will be ready to use the next day. A large frozen item, like a turkey may require at least 24 hours for every 5 pounds of weight to thaw. Foods can be thawed in the microwave, according to the directions in your owner’s manual. Cook them immediately as bacteria begin to grow as the food is warmed. Cold water thawing is faster than refrigerator thawing but requires more attention. Place the food in a leak-proof package or bag and submerge in cold tap water; change the water every 30 minutes. A one pound package may thaw in an hour or less; 3- to 4-pound packages may take 2 to 3 hours; and a turkey may take about 30 minutes per pound. As with microwaved food, cook immediately after thawing. 4. a. 3 to 4 days: Use refrigerated, perishable leftovers within 3 to 4 days or freeze them in airtight freezer-quality packaging or storage containers. Frozen leftovers are at best quality for about 3 to 4 months; however, they will be safe indefinitely at 0ºF. , poultry and seafood to help assure food safety. manufacturer recommends otherwise. Replace cutting boards if they become excessively worn or develop hard-to-clean grooves. 6. c. Use a food thermometer: You can't tell whether meat, poultry or seafood is safely cooked by looking at it. They can be pink even when they have reached a safe internal temperature. You can’t count on a food being at a desirable end temperature when the juices run clear; for example, a turkey may be overcooked by the time the juices run clear. USDA recommends these meat, poultry and seafood temperatures. 8. c. Cook poultry and meat without washing them: Washing raw meat and poultry can help bacteria spread. Their juices can splash onto and contaminate your sink and countertops. Rinse produce thoroughly under running water. 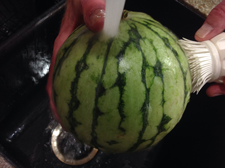 Washing fruits and vegetables with soap, detergent, bleach or commercial produce washes is not recommended. Dry produce with a clean paper towel or cloth towel to further reduce bacteria that may be present on the surface.